Yes, I haven’t been around for a while. The reason is that I’ve been busy setting up my other weblog, SegwayEuroTour, a process which I confess is as yet still incomplete. Still, the writings over there is rather different from what you’re accustomed to finding here on EuroSavant, so I can make at least a theoretical case that I should be able to pursue both simultaneously. I’ve just had a brand new Segway HT (a p-Series, for those of you in-the-know) shipped over here to me in the Netherlands, you see, where such things are as scarce as hen’s teeth. I’ve already had great fun taking her (her name’s “Marleen,” by the way) out in public, and so far that has just been to take around to show to acquaintances! There are surely many more adventures to come, and they will be chronicled over at that other site. “We know the EU as a big bureaucratic system. Nations without any face, without body,” begins that introductory article. The point of this series is to do something about that for Politiken’s readers, to provide precisely that face to each of the EU’s fifteen current members (in articles appearing up to the big May 1, 2004, expansion date) and then to the ten new members (in articles after that). “How do these different lands see themselves? What are their special values? And how can each enrich a common European culture?” – Politiken intends to approach one “characteristic voice” from each country – generally a prominent cultural figure of that land – to provide the following concerning their respective country (with their commentary, of course): a painting, a photograph, a person, an object, a text, a piece of music or song, a poem, a food-dish, a place, and an event. To this point, the countries covered are Denmark, by historian Ebbe Kløvedal Reich (no surprise; after all, Politiken is of course primarily all about Denmark); the United Kingdom, by Booker Prize-winning fiction author A.S. (for Antonia Susan) Byatt; the Netherlands (or, as Politiken and many other people put it, “Holland,” but let’s not get into that here), by Dutch author, poet, and essayist Cees Nooteboom; Sweden, by journalist and mystery-novel author Liza Marklund; and Belgium, by Flemish fiction author and translator Paul Claes. Painting: “Liberty,” by Storm P. (1938). Photograph: Tine Schmedes breast-feeds her child in the [Copenhagen] city council, 1974. 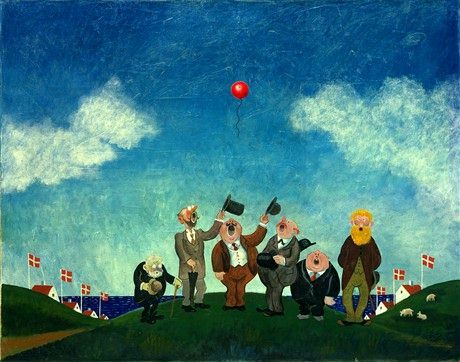 Significantly, Ms. Schmedes represented the part of Copenhagen that is the self-declared “free city” of Christiania in that city council – those of you not familiar with Christiania will simply have to take a look at that link. “It’s hard to imagine that something similar could happen at the city council of any other European capital,” Reich writes, along with “Danish women are clearly difficult to oppress.” Indeed. Object: The Christiania-bicycle. Christiania again; herre Reich clearly has a thing for it, and seems to think that that basically hippy part of Copenhagen represents the whole country. I don’t agree. (But what do I know? I’m not Danish – I’m uptight American.) Check this out, too: Reich claims in this caption that “Even today . . . Danes bicycle more than any other people in Europe.” I’m sure the Dutch would object to that! Text: The preface to the Jyske Lov, or “Jutland Law,” published in 1241 by Bishop Gunner of Viborg (a town in Jutland, naturally). Apparently this was some sort of Danish Magna Carta, asserting Denmark to be a society founded upon law, not the untrammeled rule of kings. Song: “Elverskud – Here in the East the Sun Comes Up,” by composer Niels W. Gade. With the lyrics provided: “In the East the sun comes up/ and spreads gold throughout the sky,” and you’re going to have to learn Danish or ask a Dane for the rest. Poem: “Kirsten and the Way from Gurre,” by Frank Jæger. (Remember: Poem titles are not required by the laws of any country to actually make any sense.) Verses provided below, of course. 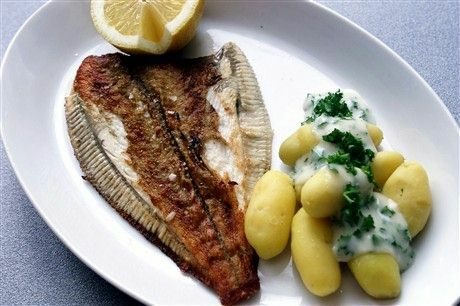 Food-dish: Butter-fried plaice (that’s a fish) with parsley-sauce. Yum yum. But it should be no surprise that fish is chosen as Denmark’s representative dish. 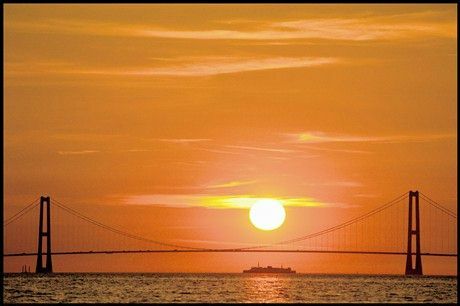 Place: The bridge over the Storebælt, or the strait between Sjælland (that’s the island that Copenhagen lies on) and Fyn (that’s the next big island to the southwest, where Odense is). A very reasonable choice, I think; a remarkable engineering achievement. And illustrated with a beautiful shot of said bridge at sundown. Event: The people’s strike of 1944, i.e. while under Nazi occupation. As Reich points out, the German invasion of 1940 and the liberation in 1945 both came from without, while this “people’s strike” came from within: it was the first and biggest mass-action against the Nazis, to show the entire world, in Reich’s words, “that the Danes were not Hitler’s allies.” The German response cost over 100 Danish lives, with 600 wounded. Still, very interesting, and I think I’ll go on to the other countries in following €S entries, unless a flood of e-mail comes in saying “No! Please don’t!” Actually, I think I’ll do so regardless; this is basically public broadcasting here, folks – you get presented what’s good for you, it’s free-of-charge – all guided by one dominant personality and set of tastes, namely of course mine. Why don’t we make a deal: the next one I take up will be the UK, and that should be great fun! (After that, the Netherlands – of course!) And I also promise that I’ll strive to continue presenting more-usual €S fare – current events coverage, that sort of stuff – alongside these excellent cultural country treatments from Politiken. Deal?